A sunny campsite is no fun place to hang out. But earlier this month, despite a lack of tree cover in my family’s site at a state park, I converted our entire camp kitchen area into an oasis of shade. The product used was the Shadehouse (updated 2016 version is called the Shade Maker 2), a wall-less shelter from Kelty that’s made with the sole purpose of providing reprieve from bright rays above. A single ply of polyester and beefy tent poles stitch together in minutes to offer substantial coverage. You can park a large picnic table under the Shadehouse’s canopy and still have room to spare. It comes in two sizes, medium and large, both offering more than 100 square feet of coverage and a tall ceiling above 6 feet. My family set up its camp kitchen and eating area under the Shadehouse, and for an entire weekend we enjoyed the shelter despite sun, rain, and big winds that came one afternoon. Staked out, the Shadehouse is solid even in a harsh gale. Thunderstorms on our trip made us retreat at one point into our car. We watched as rain pooled on the roof of the Shadehouse and huge winds threatened to parachute it away. But the shelter held, and after the rain quit a quick tap from underneath on the canopy ceiling shed the pooled water off the side and into the dirt. 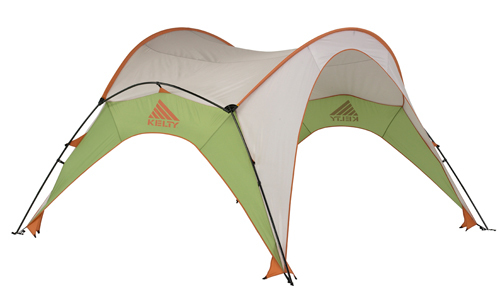 Kelty now sells the Shade Maker 2, which is the updated Shadehouse from 2012, for $200. (Online, you can find past versions of the shelter for as low as $140.) While perhaps pricey for an accessory item, for people who frequent sunny camping spots the Shadehouse is worth the entrance fee. When you’re ready to go, the unit packs up into a duffel bag and weighs about 12 pounds with its poles. This is a drive-up campsite product only. Do not anticipate bringing it backpacking. 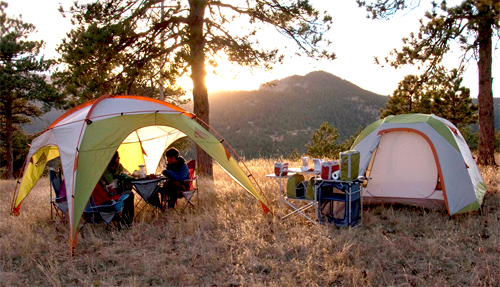 Beyond camping, the product sets up quickly enough for use on sunny afternoons at a beach. Sporting events in fields or other shade-less venues are candidate for hauling along the Kelty unit as a pop-up oasis. In any sunny place, the product offers a sweet little sequestered spot of shade. That’s a pretty priceless addition to a campsite or any other place that is otherwise rendered inhabitable by the harsh light from above.